Militancy v peaceful protest: Is there a divide in the animal liberation movement? Every animal liberation group has its own opinion on the most effective way to bring awareness to the issue of animal exploitation. Some groups favour peaceful protest or to lobby politicians for policy changes, however, others have taken a more aggressive approach. This was the case at least in France where seven French butcher shops in the Hauts-de-France region were vandalised with a blood substitute in April. The responsible parties also threw stones at the shops and scrawled graffiti on the windows at night claiming “no to speciesism”. In the last two months, four more butcher shops and restaurants have fallen prey to similar activities and there was an attack in Yvelines, a French province next to Paris, at the start of this month. The head of the French confederation of butchers, Jean-François Guihard, demanded police protection in a letter to the French Interior Minister. Veganism is a “form of terrorism” whose aim is “to make disappear a part of the French culture” he said. While Mr Guihard’s attempts to associate the vegan movement with terrorism is quite absurd, the case raises questions about where should we draw the line in highlighting animal rights issues? The French vegan association L214 told Le Monde that the actions do not help the vegan cause, but added that “anger” from an extremist minority has amounted due to “political inaction” over animal exploitation issues in the country. 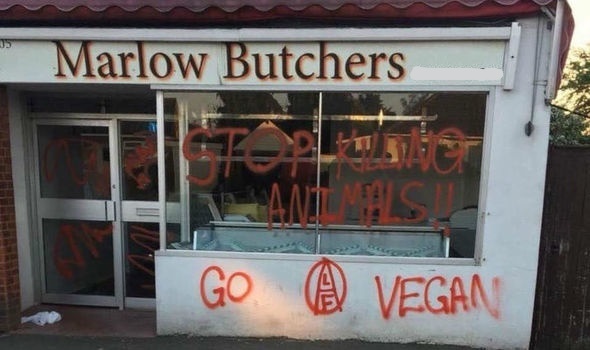 Direct Action Everywhere (DxE), based in Northern Ireland told The Green News that while they also understand the frustration of these vegan activists, any form of violent or aggressive activity is unacceptable. DxE uses non-violent tactics such as shop disruptions and protests but stays outside the places of protestation. Their intent is to create a shift in culture and change social thinking. 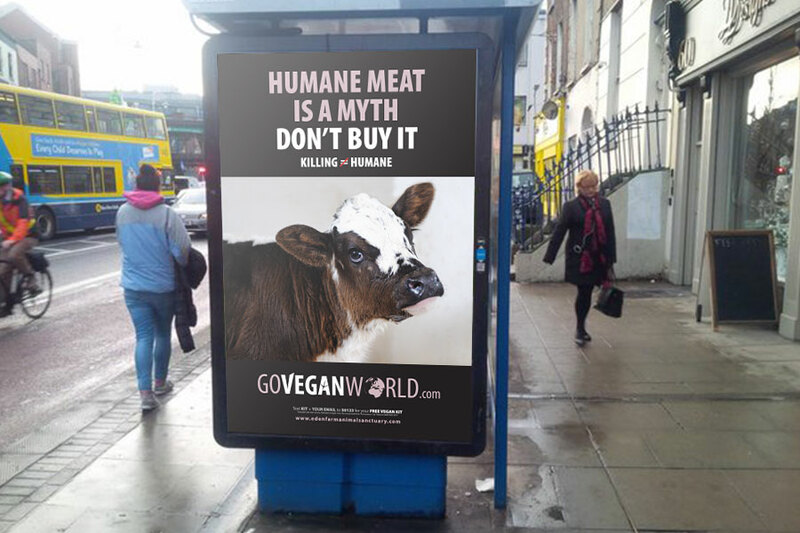 “Ideally we would cause nobody any discomfort but at the same time there are billions of animals suffering,” said Matthew McKeefry, an organizer of DxE. The conversation should focus on “the billions of animals who are being violently exploited,” he said, and less on the “very small number of humans experiencing a far lesser degree of discomfort”. Clif Grant, who started DxE with McKeefry two years ago, now has his own groups called VKind, which he says focuses on “education” through conferences and pacifist marches. He disagrees with the heavy-handed approach taken by the activities in France. “When you raise your voice you may as well put your hand on someone’s chest and push them away,” he says. The long-time activist disagrees with the latest vegan attacks in the French butcher shops, adding that the only way to really impact change is by engaging the consumer and “stopping the demand”. “Butcher shops are only fulfilling a demand,” he says. “The only way to [stop demand] is to inform the consumer on the truth about animal agriculture,” he explained. Grant thinks that the French butcher asking for protection is “a positive sign” for the vegan movement as it shows that it is growing. “The butchers are trying to protect their livelihood but it’s one based on killing, oppression and injustice,” he adds.